These tags are 4 on an 8 1/2 x 11 inch sheet of stock. 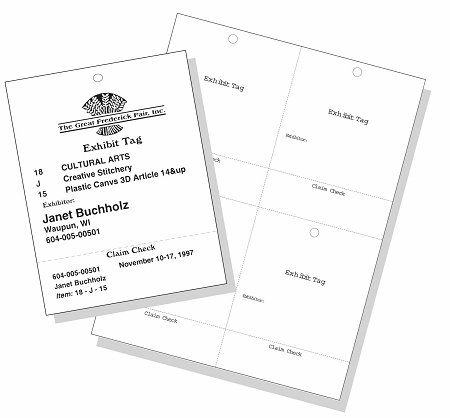 The Display Entry Tag has space at the top of the tag where you can print the fairs logo or other design. These tags are about 50% larger than the Standard Laser Tag. compatible with the Blue Ribbon Fair Management System and others. They also contain a claim check and are scored to allow easy folding over the name. 1000 tags per package (250 sheets). Copyright Martech Systems, Inc. All Rights Reserved. eCommerce Software by 3dcart.